The last in the line of the most famous fighter of them all. Many say these latter marks are not true Spitfires, but a quick glance by most tells you that she's all Spitfire and worthy of the name. The West Wings Spitfire is a great model that has undoubted 'Spitfire' presence and combines that with superb flying performance. So many lightweight models of Spitfires fail to emulate the true outlines that we know and love. The West Wings 'Spit' has it all, even down to radiators, cam cover bulges, carburettor scoop and accurate spinner outline. That characteristic 'Elliptical' wing is faithfully recreated, down to the curved upper surface of the main wing spar and the often overlooked straight centre section. The wing fairings are carefully constructed from a combination of balsa formers and curved paper. The paper areas are printed on the plan to make this easy for you. 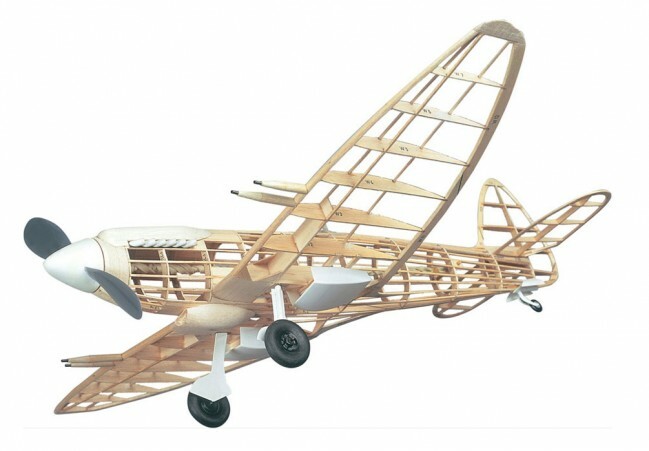 All wing components are derived from printed balsa sheets and the supplied strip wood. The fuselage is built up in the familiar 'half shell' construction over the plan using printed sheets and strip. It has the correct grades of wood for each area to ensure a good combination of strength and low weight. There are useful tips shown, such as making the ejector exhausts from short lengths of drinking straw, simple when you know how! At 625mm (24.6") span, she's a good size and has good solid 'sit' in the air. The size gives the builder the best chance of flight success and gives you a great scale model to be proud of. If, like many, you've just got to build a Spitfire, make it the West Wings Spitfire 22/24 and you'll end up grinning from ear to ear!! The kit includes Plastic Propeller & Rubber Motor, Wheels, Radiator, Spinner, Canopy and Decals. As is usual with this kind of kit, you will still need to purchase glue and paint.